Distracted driving continues to be a hot topic across Canada, with several provinces over the past year increasing fines for using a phone while operating a vehicle. With tickets that can set a driver back up to $1000, Ontario and Prince Edward Island have the highest fines in the country. Alberta implemented its distracted driving laws in 2011. 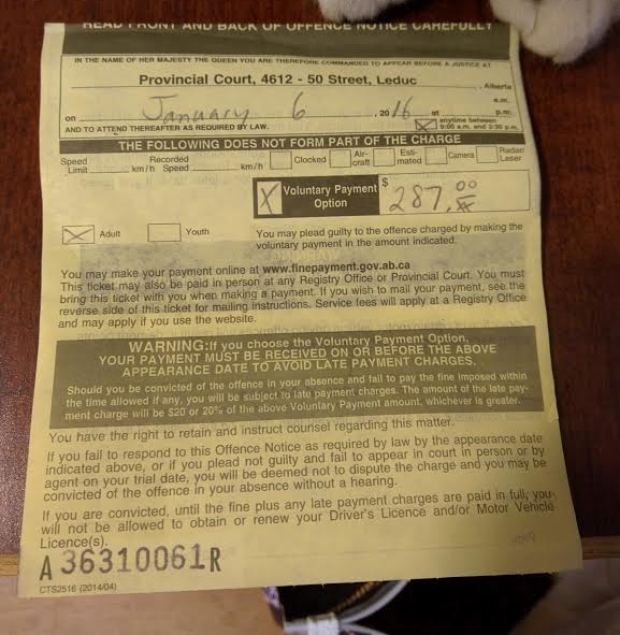 More recently, the province increased the fine associated with the offence to $287. Resident A.J. Daoust is one of the latest residents to receive such a fine for using his mobile device while behind the wheel. Daoust was reportedly issued a fine for replying to a text message while waiting for his coffee at a Tim Hortons drive-thru. A police officer noticed what Daoust was doing, knocked on the window of his car and asked for his information so that he could issue him a ticket. “I didn’t really know what was going on. I thought maybe it was somebody getting donations for something. I said, ‘In a drive-thru? Really? '” said Daoust in an interview with CTV News. “He was definitely within his rights… but to me this is ridiculous. It’s just kind of heavy-handed. It’s stupid… It didn’t have to happen, but I guess that’s how it goes,” he continued. Daoust doesn’t plan to fight the ticket but says he will ask for a reduction in fine. The officer did have a heart, though; he let Daoust get his Timmies before handing him the ticket.